Jeweler Marilyn Lindsley of Corvallis and vinyl artist Bill Thompson of Albany will be the featured artists during June at Gallery Calapooia, 222 First Ave. W. in downtown Albany. Their show, “Two Artists, Many Layers” will highlight the ways that they both work with layers to create their art. 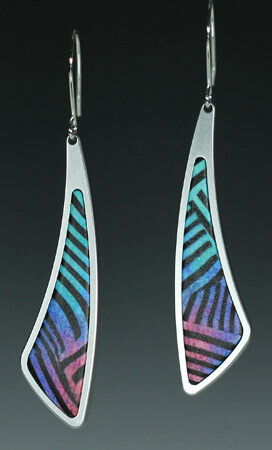 clay with various textures and pigments but now adds aluminum bezels to the clay pieces. layers of technology supporting layers of polymer clay art. alignment of each layer is critical, each picture is limited to 4 or 5 colors. Thompson, as well as 18 other mid-valley artists. Wine, beer and snacks will be served. Gallery Calapooia is in its fourth year of operation. 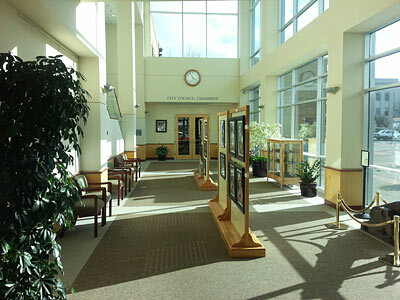 Gallery hours are 11 a.m. to 6 p.m.
Tuesday through Saturday. 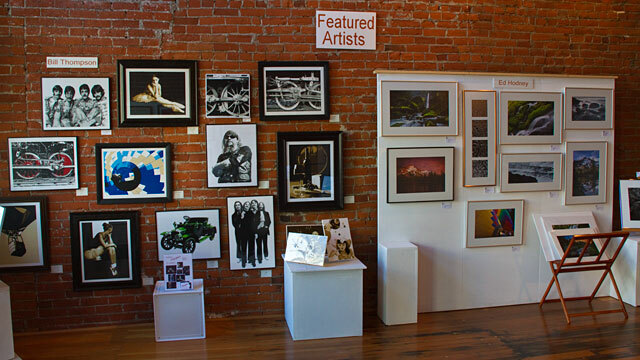 The gallery is a nonprofit organization and donations to it are tax deductible. This entry was posted in and tagged Bill Thompson, exhibit, Gallery Calapooia, Marilyn Lindsley, Reception on June 2, 2017 by Rob Robinson. Stop by Albany City Hall to see an exhibit of Bill Thompson’s layered vinyl and copper repousse artwork. The show will run the month of August. This entry was posted in and tagged Bill Thompson, exhibit on August 3, 2015 by Rob Robinson. In the July Gallery Calapooia Newsletter that went out today, the wrong location was given for Bill Thompson’s August Exhibit. The show will be at Albany City Hall, not the main library as stated in the newsletter. Please stop by City Hall to enjoy Bill’s layered vinyl and copper repousse artwork during August. This entry was posted in Albany, Exhibit and tagged Bill Thompson, exhibit on June 30, 2015 by Rob Robinson. Gallery Calapooia artists, (l – r) Nancy Anderson, Bill Thompson, Cheryl French, Melissa Saylor,and Lynn Powers, preparing for Albany’s Downtown Twice Around Parade. Five Gallery Calapooia artists, Nancy Anderson, Bill Thompson, Cheryl French, Melissa Saylor, and Lynn Powers, participated in the Downtown Twice Around Parade this past weekend. They entertained parade watchers with their precision portrait drill routine. This entry was posted in Albany, Event, Gallery and tagged Bill Thompson, Cheryl French, Gallery Calapooia, Lynn Powers, Melissa Babcock Saylor, Nancy Anderson on December 13, 2014 by Rob Robinson. 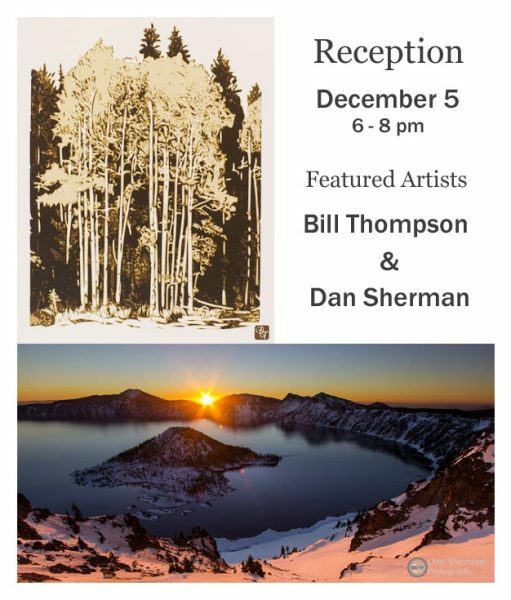 Join featured artists for December, Dan Sherman and Bill Thompson, at our reception on Friday, December 5 from 6 – 8 pm. 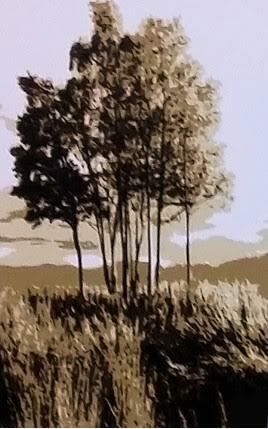 This entry was posted in and tagged Bill Thompson, Dan Sherman, Gallery Calapooia, Reception on December 5, 2014 by Rob Robinson. See how it is done! 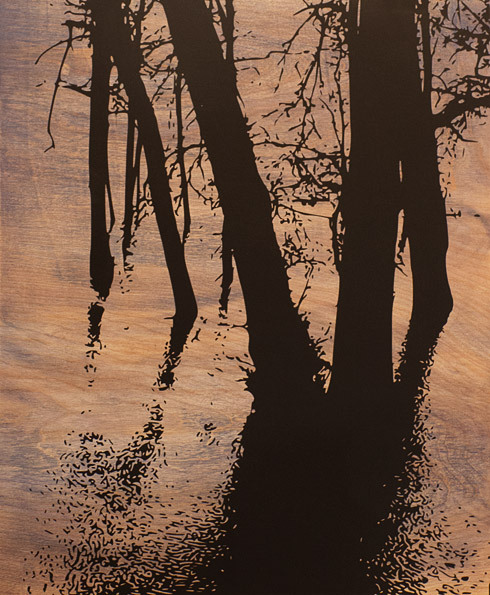 Join us for the December 5th reception to see two demonstrations by Bill Thompson showing how he makes his intriguing layered vinyl images. Also, you can ask Dan Sherman about his travels in the Oregon outdoors, capturing its beauty. 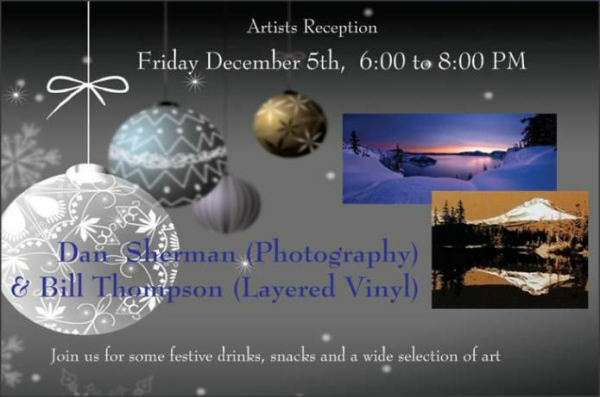 This entry was posted in Exhibit, Gallery, Reception and tagged Bill Thompson, Dan Sherman, layered vinyl, photography, Reception on December 3, 2014 by Rob Robinson. Thanks to everyone who came to our reception on Friday night. We had a good time and hope you did too. Our next reception is coming up soon – Dec. 5! 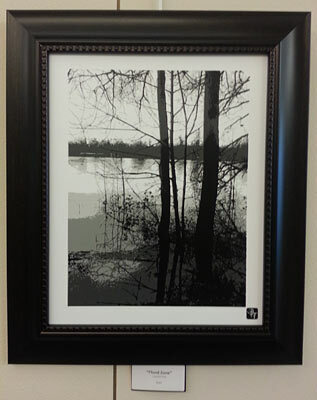 This entry was posted in Event, Exhibit, Reception and tagged Bill Thompson, Dan Sherman, Gallery Calapooia, Reception on November 23, 2014 by Rob Robinson. Trick or Treaters received some very special treats – hand-painted sketches of their costumes by Cheryl French, their names in calligraphy by Nancy Anderson, or images in vinyl by Bill Thompson. Bill Thompson in his second costume! This entry was posted in Albany, Event and tagged Bill Thompson, Cheryl French, Gallery Calapooia, Halloween, Nancy Anderson on October 31, 2014 by Rob Robinson. Bill Thompson has a solo exhibition of his unique vinyl artwork at the City Hall in Albany throughout March. The lower level display includes over 20 new layered vinyl pieces created specially for the show. In addition, some of Bill’s older acrylic “Pop Art” portraits are displayed on the upper level. This entry was posted in Albany, Exhibit and tagged Albany, Albany City Hall, Bill Thompson, vinyl on March 4, 2014 by Rob Robinson. 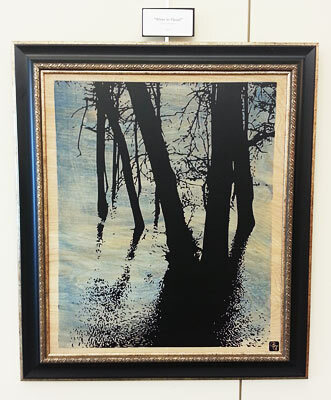 For the next month, Ed Hodney and Bill Thompson are the featured artists in Gallery Calapooia. 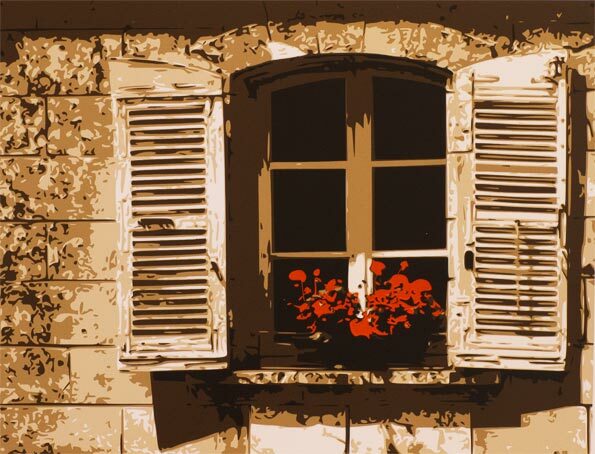 Their work is in one of the front windows and at the entrance to the gallery. Ed’s photographs are primarily of beautiful Oregon landscapes along with his more abstract vertical piece composed of four images. See if you can figure out the subject. Bill’s layered vinyl images have a variety of subjects with an amazing amount of intricate detail for artwork created using thin pieces of cut vinyl. Stop by the gallery to get an up close look at Ed’s and Bill’s artwork and a variety of work by our seventeen other gallery artists. This entry was posted in Albany, Gallery, Oregon and tagged Bill Thompson, Ed Hodney, featured artists on August 29, 2013 by Rob Robinson.